They were known as street railways, and the streetcars that followed those rails were much like a train, except they were only one car long. For forty years they created a steel network that extended well outside of our major city limits. One could hop on a streetcar in Rock Island and quickly get to Carbon Cliff, Milan, the Arsenal, or Davenport. Streetcars or trolleys (modern gasoline-powered trolleys are more accurately called a trolley bus) started out as horse drawn conveyances. Since each trolley was self-powered, it may be difficult to understand why the rails were even used. However since the early roads were not paved and the pneumatic tire hadn’t been invented, it’s easy to see that a vehicle on steel rails would offer a vastly smoother, more comfortable and hence more desirable ride than an ordinary carriage. The first Moline-Rock Island horse railway Center Station was located on Moline Avenue – today’s Fifth Avenue – at an address noted only as “east of 31st Street,” and was termed an “architectural ornament” at its opening in 1868. It had a “nicely plastered office area” in addition to the less finished stables. Trolleys were reported to seat 16 people – 14 if the women were wearing hoop skirts – but a reporter once observed 51 people on a car. Receipts for a single day were reported at $185 – a quite tidy sum for the era. Later, as Moline and Rock Island grew closer together and the streets became more defined, the address of the station would be changed to 3448 5th Avenue. Street railways were very popular, so popular that small companies developed in each of our individual cities. People rode them to work and shop – much easier than harnessing a horse at the beginning and end of the day – and much faster than walking. But on holidays and weekends, the streetcars weren’t used much. How could the streetcar developers drum up business? By providing a destination where everyone would want to go on days off. In 1882, Bailey Davenport started a trend by building a street railway all the way out 11th Street to the new Watchtower recreation area. A few years later, in 1892, an inn and amusement park at Watchtower provided more active entertainment. Moline Central Railway developed Prospect Park as a destination in the 1890s. Other railway destinations include Credit Island and Campbell’s Island. Some of our areas largest park areas are a result of the desire to keep streetcars running – and hence profitable — during slack times. In 1889, Center Station was destroyed by fire. Fifteen vehicles and 42 horses were reported lost. This postcard represents the building constructed to replace Center Station. The front of this brick building was 2-stories with the offices upstairs, while the rear portion was a single story with earthen floors and a wood truss roof. A paint shop was at the east side of the building. Farther east were separate buildings containing blacksmith , woodworking, and repair shops. Although additions were later made to the rear and the east, the front portion seen on the postcard remained basically the same. After 1908, offices of the Tri-City Railway moved downtown to the new Safety Building but the car barns remained here on Fifth Avenue. The pictured building burned on June 1, 1913, and that fire is the subject of another postcard article. However it was replaced with a new building at the same location. Streetcars continued to serve the region until 1936, when all the streetcar lines – except for one across the Government Bridge – were converted to bus lines. What caused the sudden elimination of streetcars? It has been claimed that it was a devious scheme actively pursued by hidden subsidiaries of General Motors. These subsidiaries would buy streetcar companies with the sole purpose of closing them. It is said that GM wanted streetcars off the road so people would buy their busses and cars. Others have claimed that streetcar transit was simply obsolete – big busses with pneumatic tires could go anywhere and not be tied to a steel rail. What’s true? We don’t know – but we still think it would be great to be able to hop a streetcar to Carbon Cliff in downtown Rock Island! 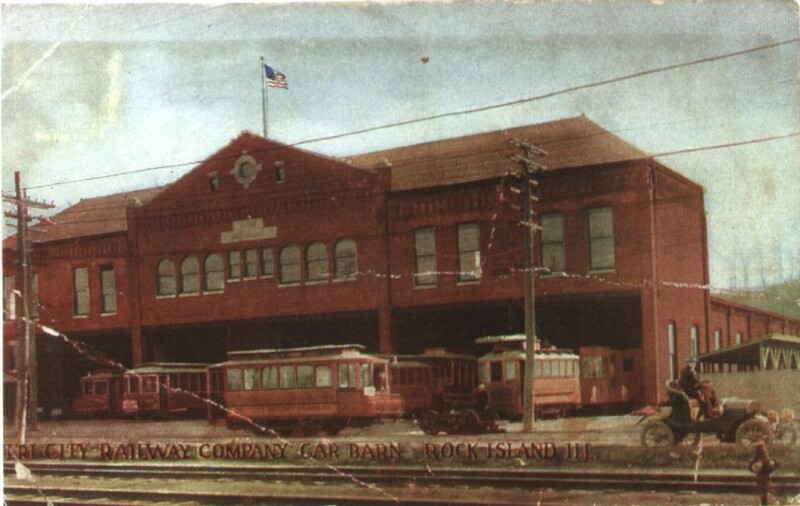 The car barn building that replaced the postcard one after the fire was used for bus storage for many years, then sat vacant until it was demolished in the 1970s. While not especially distinctive in its architecture, it represented an important era in local and national history. Now only a postcard remains to remind us of this heyday of public transportation. This article by Diane Oestreich is slightly modified from the original, which appeared in the Rock Island Argus and Moline Dispatch on March 3, 2002.